When is the last time your insurance agent or financial advisor recommended a life insurance review (or a life insurance portfolio review)? In reality, most clients have never even heard this terminology, let alone had a review done of their life insurance. Over time, people may acquire multiple life insurance policies; at significant life events, through work or associations, etc. Just like their investments, these individual life insurance policies become a life insurance “portfolio”. Just like any other portfolio, it should be reviewed from time to time for appropriateness. A life insurance review is fairly simple, takes minimal effort on the part of the client, but can prove to be invaluable in person’s overall financial plan as well as their piece of mind. Putting all of the life insurance information in one place, analyzing & digesting what coverage will be in place until when, and how much is being spent, are all valuable, but secondary, outcomes of a review. If the answer is “yes”, then a client has the peace of mind that their life insurance is in line with their goals, and they put in the one-time effort of consolidating the information. If the answer is “no”, then a client has the groundwork for what they need to do next and they can take action, if they choose. Phase 1: Gather the policy information for all existing life insurance policies. This information is consolidated and summarized for the individual (or family), the death benefits are totaled, the key dates are highlighted, and any clarifications are explained to the client. Another benefit is ensuring that the beneficiaries listed on the policies are in line with the clients’ wishes. Phase 2: Determining if the amount of life insurance is in line with the needs, wants, or goals of the client(s). 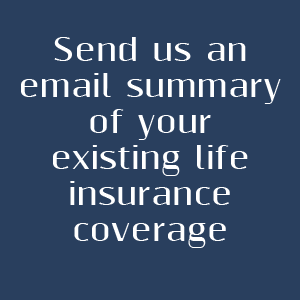 Personalized analysis calculation – [we need to have a link to a “contact us”, that pops out into an email with the subject line “Life insurance information”.] this is an advisor-guided, but relatively brief, assessment of the individual, their household, and their goals. It will take into account- debts, income replacement, final expenses, number of children, college funding needs, legacy goals, whether the surviving spouse will work, etc. as well as estimations for inflation rates & investment yields. The client supplies the wants and goals, the “heavy lifting” (number crunching and analysis) is done by the advisor. For policies other than level term, we recommend that the full policy documentation (schedules, financial modeling, policy language, etc.) is also reviewed so the mechanics of the policy can be weighed, understood, and considered in the overall life insurance portfolio. General guidelines; 30x income for ages 20-29 · 20x income for ages 30-39 · 15x income for ages 40-49 · 10x income for ages 50-59 · 1x assets for ages 60+. Amounts may vary by carrier and state and additional circumstances, consult a member of the Insuring Income team [link to our “Contact Us” form] for a personalized calculation.